Edited by Ross F. Collins, professor of communication, North Dakota State University, Fargo. Requirements for professional media editing in the twenty-first century have undergone enormous technological change. Editors still edit copy. But today they do much more. Mass media editors must demonstrate skills from computerized pagination to social media monitoring, from image manipulation to Search Engine Optimization. The need for editing skills is reaching far beyond traditional journalism and into all areas of mass media, from newspapers to strategic communication. Public relations practitioners are expected to edit. Even advertising creative professionals must edit. And journalists taking on new roles as social media editors need to understand editing at the speed of digital media. This textbook aims to prepare university-level students for these expanded editing roles in an age of convergence. Thirteen authors representing more than two centuries of collective media experience examine both traditional editing roles and new editing needs to meet the demand of a changing industry. While many mass media students will not become professional editors, this textbook assumes nearly all will need competent editing knowledge to produce products of professional quality. Editing, the authors believe, remains a bedrock skill for all students who hope to be successful in the mass media. 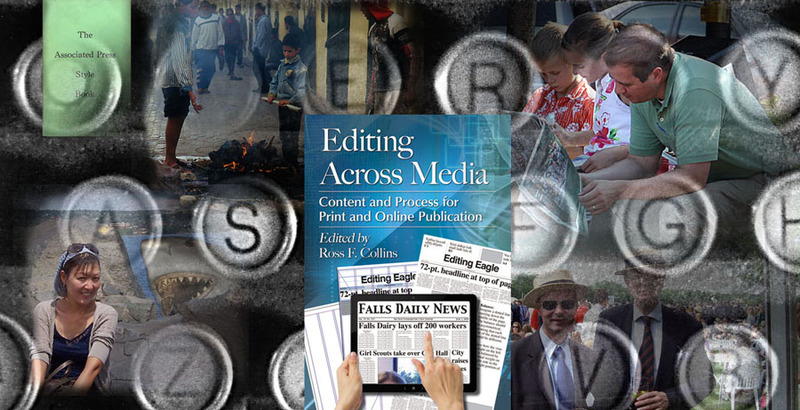 Ross F. Collins, ed., Editing Across Media. Content and Process for Print and Online Publication. Jefferson, NC: McFarland Publishers, 2013. $39.95. New! Five top controversies of English grammar. Go to editor's home page.